Rome is a wonderful city but it is, after all, a noisy, busy, annoying place. Motorini buzz up our street at all hours, buses discharging their air brakes echo in the night, and even the church across the street hums with activity as late as 11:00 PM. Seagulls sometimes screech as early as 3:30 AM, and compete with a songbird whose otherwise beautiful song is not quite so lovely at that dark hour. So we seek to leave the city, walk without worry of careening motorini, and give our ears a rest. Even a single day out of Rome can leave one refreshed. So it was with delight that we accepted the invitation of friends to join them at their home in a tiny town almost too small for the map. As we leave Vico, heading up a rural road. 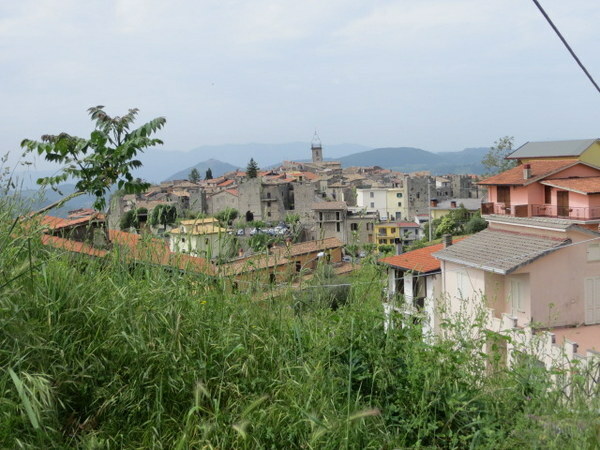 The official town site says Vico Nel Lazio has a population of 2258. That might be true on a day that everyone who owns a home there shows up and brings the extended family. Our friend Gigi, whose family has had a house in Vico for 5 generations, says there are maybe 1000 people year-round. There are two bars, a tabaccheria, and a bakery. Everything else is down the hill a few kilometers away, except for the 8-or-so churches. Vico sits at over 700 meters above sea level. This medieval village dates back to at least the 13th century. The ancient gates are still in use and many of the original 24 towers still visible. It is not a tourist destination. Tiny Vico Nel Lazio as seen on our ascent. Driving about an hour and 45 minutes from Rome, we arrived late one Sunday morning to be greeted by Emanuela in the town piazza. Shortly, our group of 7 set out on a two-hour mountain hike, high above Vico. Gigi has been hiking these hills all of his life and took us meandering through grazing cows and horses with foals alongside. We could never have done this on our own. We’d be wandering there still today without his expert guiding. Along the way we shared stories with the accompanying Italian friends, picking up new vocabulary words as they willingly helped us with their language. As storm clouds threatened across the valley, we found a trough high in the hills. It must have been there for a very long time, fed by a spring. Luckily the rain arrived only as due gocce (a few drops). Heading back to Vico we enjoyed il pranzo della Domenica (Sunday lunch) in the picture-perfect setting of Gigi and Emanuela’s garden. Following antipasti of salumi and cheese, there was homemade fettucine by the talented Maria, roasted suckling lamb and potatoes, salad, fruit, pastries and wine. It’s no wonder some of the group took to napping in the grass. Click on any photo below for a slide show. 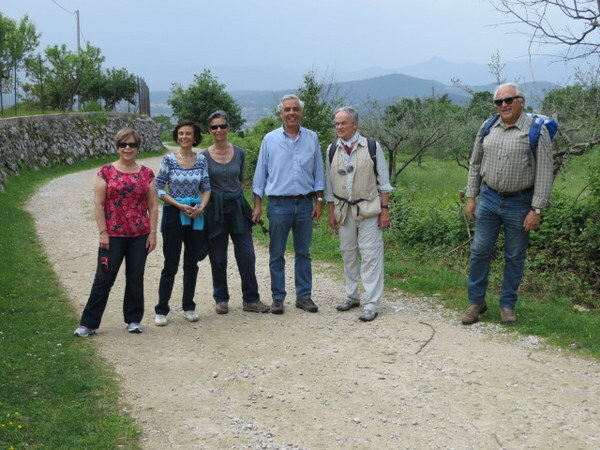 Ludovica, Paolo, me, Emanuela, Fabio & Gigi prepare to hike. Mountain meadow on our trek near Vico Nel Lazio. Cows roaming free in the mountains, raising their calves. Gigi waves us in and the cattle soon departed. Spring-fed trough for cattle and horses. Good enough for people if you take your water above the animal trough…. The cattle get a turn at the trough as we leave. Gigi photo bombs Ric at the high mountain trough. Emanuela and Fabio are at right. Maria delivers a massive platter of fettucine con ragu to the garden table. The pasta was “fatto a mano” that morning. We gather for lunch as Maria brings the pasta. Delicate pastries from a Roman shop round out the meal. Casa seen from the garden. It is HUGE. View to the sky from the cortile. Medieval gate exiting Vico Nel Lazio. Driving back to Rome the reality of urban life struck all too quickly as we encountered intense traffic and logistical problems in navigating our way home. But we had a lovely day in the country free from noise and traffic. Lovely. Lovely!!! You look fantastic my friend!! Miss you guys!! Cio Bello! Miss you too! We will be in Portland in October. See you then!!! So beautiful! Jennifer and I could spend the whole day in the field with the horses and their foals. And that would definitely be the perfect dinner to finish the day. I though of you as we walked there! There were two dogs guardign the horses — not the cows! — and they were VERY protective. we gave them a wide berth. You’ve got it made! The sights and sounds of a beautiful and vibrant city to get your blood flowing all week…and then beautiful country and the comfort of friends to ease your souls on the weekends! Aaaaahhhhhh……Goditela tutti i miei amici! Ciao Susan! We would have it made if only we did not have to drive to these wonderful places. So stressful! The train is much better but it just does not go everywhere! Such a wonderful sounding day. The countryside is so calm looking. Do your friends live there year around? Hi Carolyn! No, they live in Rome. Vico is their getaway from May-October. There is no heating (only two fireplaces) so a bit chilly in winter. I love that they are still using the original medieval gates and that 24 of the towers are still intact and it is NOT a tourist destination. Leaves one thinking there must be many such jewels scattered throughout Italia. Lovely. It is telling that you took photos of the cows. Speaking of bustle, I am writing this from our beach house in Newport Beach, Ca and everynight the airplanes go overhead ( having taken off from John Wayne airport ) until ( officially ) 9:30 and then the helicopters start. Bustle in the air. We will not miss that part. Oh there are so many jewels….. We will never even “finish” with Rome, much less the rest of the country. Una vita non basta! 3.30 is a -bit- early for birdcall…..
sounds like a lovely day away…. We do love Rome! But it’s easier to appreciate when you get out now and then.